February 23, 2012 - On Wednesday, the General Aviation Manufacturers Association (GAMA) released the industry’s fourth quarter and complete 2011 shipment and billings summary. “Shipments declined in all three industry segments from the previous year, but the declines reached single digits which indicate general aviation is reaching the trough in this cycle,” said GAMA Chairman, Caroline Daniels. In the fourth quarter of 2011, Cirrus Aircraft delivered more airplanes than in any quarter since the end of 2008, resulting in its strongest performance of the past 12 quarters. As previously reported, twenty SR20 aircraft were completed during Q3‘11 with final delivery taking place to the Civil Aviation Flight University of China (CAFUC) in Luoyang, China in Q4. 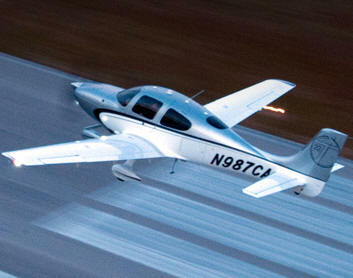 Cirrus Increased its single engine piston aircraft market share by two points to 35 percent in 2011, an all time high. The company increased its SR22/SR22T comparable market share by five points to 73 percent in 2011, an all-time high. The company also increased its SR20 comparable market share by three points in 2011, as the preference for the SR20 is growing as both a trainer and personal transportation airplane. Along with Cirrus delivered the most certified single engine piston airplanes of any general aviation manufacturer in 2011. The SR22/SR22T family of aircraft remains the best-selling four-place airplane in the world for now 10 years in a row. On January 10, 2012, Cirrus introduced a range of compelling new features on the SR-series line of aircraft. New 60/40 Flex Seating offers seating for three in a redesigned back seat allowing for five total passengers on board. The new back seats also feature three-point seat belts for greater comfort, can recline in three positions, can secure child seats via the automotive style LATCH system and completely fold down for maximum cargo carrying options. With Perspective Global Connect, Cirrus pilots can now make phone calls and send text and email messages in flight. Outside the U.S., graphical weather is now available via Global Connect. Other new 2012 features include the GMA350 audio panel from Garmin, new interior and exterior color, materials and schemes and new personalization options. The Vision SF50 personal jet remains the primary new aircraft research and development project at Cirrus. The next public and media program update is scheduled for Q1‘12.